Daily Mining Gazette/Joshua Vissers Baraga County Sheriff Rick Johnson and KBIC Tribal Police Officer Tony Loonsfoot sit across from Robbie Schultz and Karen Kautto at Java by the Bay in L’Anse. 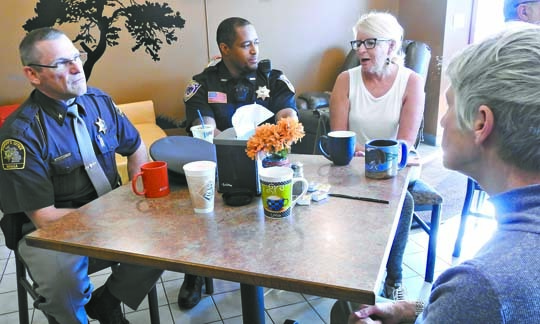 L’ANSE — Police officers and community members gathered at Java by the Bay in L’Anse on Friday morning for an opportunity to discuss issues in the community. Sergeant Jeremy Cleary and Lieutenant Randy Danison from the Michigan State Police Calumet Post were there, as well as Baraga County Sheriff Randy Johnson and Keweenaw Bay Tribal Police officer Tony Loonsfoot. The mood was genial as small groups talked about problems facing the community, including drug abuse, the difficulties facing police officers because of recidivism, and who handles what calls when someone in Baraga County calls 911. “They’ll send anyone,” Loonsfoot said. Emergency dispatchers will send any available officer to the scene of an emergency, regardless of the jurisdiction. While the Tribal Police can only ticket tribal members on the L’Anse reservation, they have the authority to pull anyone over, and will hold them until county or state officers arrive, Loonsfoot said. The reverse is also true. “Local departments get along,” Johnson said. Robbie Schultz expressed the desire to help officers in their fight against meth-amphetamines, but despite discussion around the table, no clear way of assisting the police was determined. While getting anonymous tips help, officers have to present sufficient, non-circumstantial evidence to obtain a warrant from a judge before they can enter a private residence, which is not as simple as it sounds, according to Johnson. The officers also talked about their history on the force. Loonsfoot and Johnson, who have been in their departments for 12 and 34 years respectively, have never had to discharge their weapons as part of their job. Johnson did relate, however, that on his first day on duty, he was forced to draw his gun, alongside five other officers.